So there you have it. 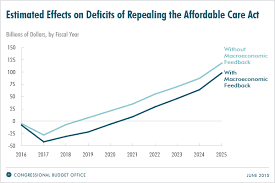 Repealing the ACA, the premiere policy goal of just about every Republican House and Senate member, will dramatically increase both federal deficits and the numbers of uninsured Americans in a report signed, sealed, and delivered to Capitol Hill by Republicans’ newly appointed CBO Director Keith Hall. Hall replaced the prior highly respected CBO Director Doug Elmendorf (who was just announced as the new Dean of the Kennedy School of Government at Harvard beginning next January). In a desperate attempt to find a silver lining, Republicans proclaim that ACA repeal will spur economic growth “because provisions of the law that are expected to reduce the supply of labor would be repealed.” What does this mean? In prior reports, CBO estimated that about 2 million Americans would stop working because the ACA allows them to obtain health insurance outside employment. Mostly, this involves older workers nearing age 65 hanging onto unsatisfactory jobs to qualify for employer health insurance. Repealing the ACA would compel many of them back to work for health insurance. For the first time, this CBO report incorporates “dynamic scoring” (DS) in its estimates. Happily, CBO chose to report results using both standard and DS methods. Dynamic scoring has long been a favored Republican approach to justify tax cuts on the basis of hypothesized economic growth. When Republican Presidential candidate Ronald Reagan first promoted DS in his 1980 campaign, his primary opponent, George H.W. Bush, ridiculed it as “voodoo economics.” In President Reagan’s subsequent tax cuts in the early 1980s, and in President George W. Bush’s tax cuts in the early 2000s, DS effects did not appear. Instead the both cuts triggered massive federal deficits. Nonetheless, DS remains a popular approach with Republicans who mandated its use at CBO earlier this year for the first time ever. Throughout the Report, frequent cautions are issued: “The estimates of the macroeconomic effects and of their consequences for the federal budget are highly uncertain, however, and actual results could be substantially different.” Amen. Elsewhere, many detailed estimates are informative and untainted by DS. For example, to pay for a large part of the ACA’s cost, the law reduced Medicare payments to hospitals, insurance companies and other medical providers. In 2010, the 10-year revenue estimate from the cuts was $450 billion between 2010-2019. But the reductions didn’t take effect until 2012 and beyond so the new $879 billion estimate, 2016-2025, represents the fully loaded impact. Repealing the ACA would restore these reductions, hiking Medicare’s 10 year cost by that amount. So, depending on how one counts the Medicare payment reductions, the actual 10-year deficit impact of ACA repeal may be not $137 to $353 billion but $297 to $513 billion. It depends on how you count. To me, here’s the number that matters most: 24 million more uninsured Americans by 2920 if Republicans get their way. I recall relentless charges of “rationing” thrown at Democrats throughout the ACA legislative process, and since. How is advocating ACA repeal and offering nothing of substance to replace not rationing? Thanks to CBO for setting the stage for what comes next.